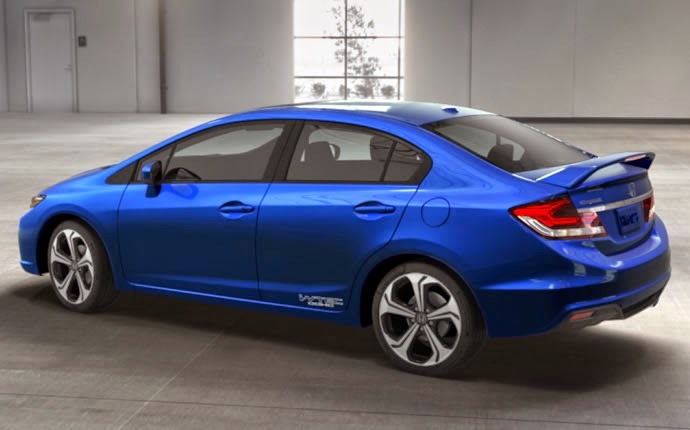 It’s a long story, but here’s the short version of it: Honda reportedly plans to start ramping up production for the hatchback version of the Honda Civic, previously only available to European consumers, with the intent to start selling them to American consumers in the near future. Mar 23, 2015 - TORRANCE, Calif.
"Most Fit EV drivers tell us they love their vehicles, and many have requested lease extensions and this extended lease program is intended to meet their needs," said Steve Center, vice president of the Environmental Business Development Office, American Honda Motor Co., Inc. "We're very confident in how the vehicles are performing, and look forward to offering new and existing customers a chance to experience everything the Fit EV has to offer." 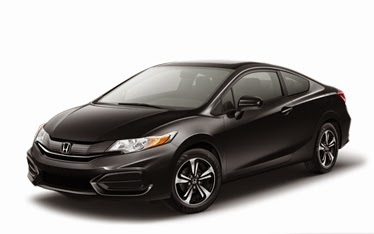 Lessees will be contacted by Honda prior to lease end for additional details about lease extensions. Fit EV customers also can take advantage of Honda's partnership with SolarCity (http://www.hondasolarcity.com/) to install solar power with no upfront cost, allowing them to recharge their vehicle with clean, affordable power from the sun. Based on its vision of "Blue Skies for our Children," Honda is taking a comprehensive approach to reducing the environmental impact of its products, advancing fuel efficiency, low emissions and fun-to-drive performance with new powertrain technologies from its Earth Dreams Technology™ lineup, which includes more fuel-efficient engines and transmissions and advanced electromotive technologies. Honda will offer several next-generation, advanced powertrain vehicles, including a new battery-electric model and plug-in hybrid model by 2018 and plans further application of its two- and three-motor hybrid systems in the years to come. Together, these vehicles will offer significant sales volume, enabling Honda to bring ultra-low carbon transportation to consumers in the U.S.
Everybody wants their car to be cool, whether they admit it or not. Plenty of consumers will shrug it off, like having a cool car isn’t as important as finding a good value, but the reality is that they would much rather have a vehicle that accomplishes both things if at all possible. The good news is that there are cool cars available for reasonable prices. In fact, Kelley Blue Book recently put out a list of “Top 10 Coolest Cars Under $25,000” for the sole purpose of proving that drivers could, in fact, take home a slick, fun-to-drive automobile without having to sacrifice a child’s college education and/or wedding fund. 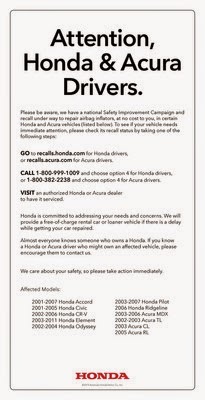 Honda has initiated a new, voluntary consumer information advertising campaign urging Honda and Acura owners to immediately check for open recalls and safety improvement campaigns, and to take affected vehicles to an authorized dealer for free repair as soon as possible. This new effort builds on the comprehensive approach Honda has taken to identify, locate and contact registered owners with vehicles included in one or more recalls to replace Takata airbag inflators. "The goals of this campaign are to save lives and prevent injuries," said John Mendel, Executive Vice President of the Automobile Division of American Honda Motor Co., Inc. "Honda hopes that this new consumer information campaign will bolster our existing and continuing efforts to reach our customers and maximize the vehicle repair completion rates associated with recalls to replace Takata airbag inflators. These ads are a strong call to action from our company designed to break through the clutter, grab the attention of customers driving affected vehicles, and urge that they get required repairs as soon as possible," said Mendel. The consumer information campaign includes a multi-million dollar advertising push that will begin on Monday, March 16. Full-page, color advertisements will appear in more than 120 newspapers, while 30-second radio announcements will air in more than 110 markets. In addition, sponsored, customized Facebook posts that mention the specific vehicle owned by each identified user will appear on owners' timelines, in an additional effort to capture attention and encourage owners to take action. The newspaper and radio advertisements will appear in Spanish or English to match the primary language of each targeted media outlet. Examples are available for download at hondanews.com. The advertising campaign will prioritize the 11 states and U.S. territories1 that have been identified by Honda as representing the greatest risk to affected owners. These geographic areas expand on the four states and territories (Florida, Hawaii, the U.S. Virgin Islands and Puerto Rico) that the National Highway Transportation Safety Administration (NHTSA) and Takata initially targeted based on the consistent high absolute humidity levels present in those regions. It is believed that high absolute humidity contributes to a greater risk of inflator rupture in certain older-model Takata front airbags. Honda voluntarily expanded the scope of the safety improvement campaign to include vehicles in Alabama, Georgia, Louisiana, Mississippi, South Carolina, Texas and California, a total of 11 states and territories, in an effort to include other potential areas that experience consistently humid conditions over extended periods of time. Honda strives for 100 percent vehicle repair completion in every recall and every safety improvement campaign it undertakes. Since initiating the first Takata airbag inflator recall in 2008, Honda has distributed millions of mailed notifications to registered owners in English and Spanish, but many vehicles included in these recalls remain unrepaired. Unfortunately, it is estimated that one-third of all recalled vehicles in the U.S. are never repaired. The problem is more prevalent among older model vehicles. To help improve owner response rates, Honda has implemented various means of consumer outreach for recall notification and re-notification, including automated phone calls, mailing notices by registered mail and overnight delivery services, enlisting the support of authorized dealers and other measures. In cases where mailed notifications have been returned to Honda as undeliverable, Honda has engaged firms with specialized search skills and access to unique databases to locate registered owners. Honda and Acura owners with any pending recalls should schedule an appointment with their local authorized Honda or Acura dealership. The dealership will replace the part at no charge to the customer. Honda has taken significant actions to accelerate the pace of airbag inflator repairs, including securing agreements with two additional inflator suppliers. As a result, Honda expects replacement part capacity to fully meet demand by later this Spring. However, the current availability of replacement parts, as well as the time required to complete repairs, could lead to delays for individual customers. If a customer affected by the Takata airbag inflator recalls requests alternative transportation until their vehicle can be repaired, including use of a loaner vehicle or rental vehicle, Honda will accommodate their needs at no charge. Honda continues to urge owners of Honda and Acura vehicles affected by the Takata airbag inflator recalls to get their vehicles repaired at an authorized dealer as soon as possible. Honda owners can check their vehicles' recall status at www.recalls.honda.com or by calling 1-800-999-1009, option 4. Acura owners can check their vehicles' recall status at www.recalls.acura.com or by calling 1-800-382-2238, option 4. 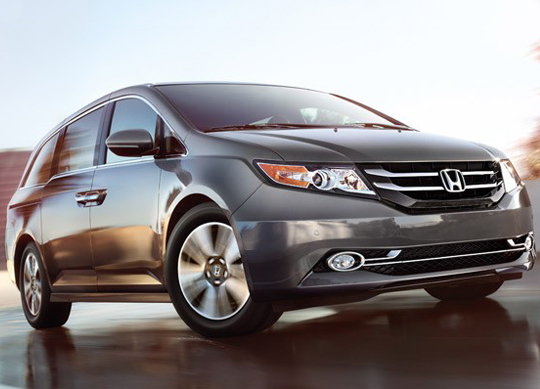 If we were to tell you that the 2015 Honda Odyssey was mentioned on this year’s Kelley Blue Book “Top 15 Family Vehicles,” chances are pretty good that the majority of our readers would not be surprised. Not only is it spacious and versatile and utilitarian, but it’s also absolutely loaded with great technology, including conveniently-located USB charging ports for teens with smartphones and optional entertainment systems in the headrests for younger kids on long trips. Some trims even offer built-in vacuum cleaners, proving just how built for families the vehicle actually is. 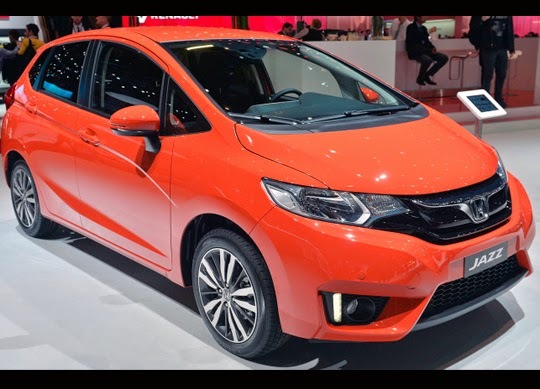 When is a Honda Fit not a Honda Fit? When it's a Honda Jazz. In other markets around the world, our pleasant little Fit hatchback uses a jazzier nomenclature, but what you're looking at here isn't simply a rebadged version of the car we know and love. For starters, the Euro-spec Jazz uses a 1.3-liter VTEC engine from Honda's Earth Dreams line, tuned to produce 101 horsepower. (The US-spec Fit, meanwhile, cranks out 130 hp from its larger, 1.5-liter engine.) That powerplant is mated to either a six-speed manual transmission or a continuously variable unit, and will be the only engine initially available at launch. From there, it's pretty much the same, save the small running lamps that flank the foglamps. The Jazz should fit nicely within not only the Honda lineup, but the booming subcompact class, with lots of onboard technology, excellent packaging (including the company's Magic Seat rear bench), and – we assume – a relatively affordable price point. In the most recent J.D. 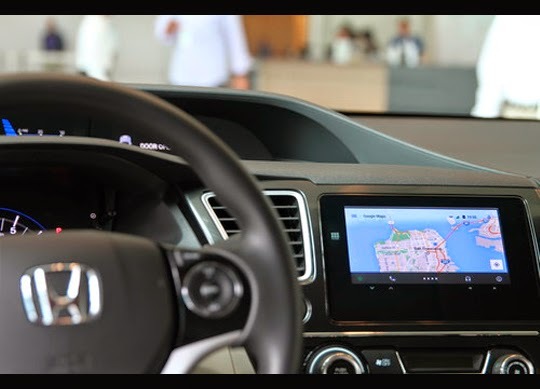 Power & Associates Vehicle Dependability Study, it was discovered that while today’s owners of automobiles generally love the cars that they buy, they do have a couple of qualms about things like infotainment systems and voice commands. American Honda Motor Co., Inc. today reported February Honda and Acura vehicle sales of 105,466 units, an increase of 5.0 percent versus February 2014. Sales of Acura light trucks set a new February record, rising 12.5 percent on sales of 8,415 vehicles. The Honda Division sold 92,474 vehicles in February—an increase of 4.1 percent for the month. The Acura brand posted sales of 12,992 units in February, rising 12.5 percent over the same period last year. 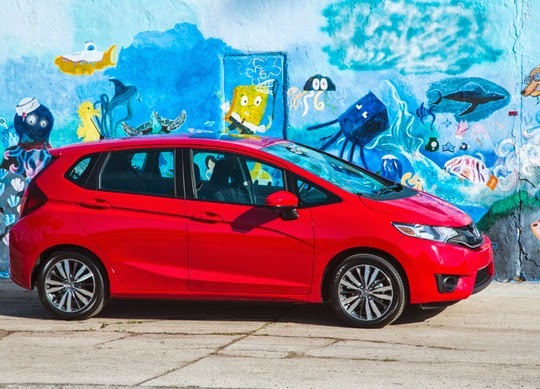 Honda's remarkable Fit subcompact set another monthly record in February, posting an 81 percent increase over year ago totals. The Pilot again showed considerable sales strength, creating strong momentum as the company prepares for the arrival of the all-new 2016 Pilot this summer. Sales of the best-selling CR-V also rose in February, gaining 7.4 percent vs. the same period last year. Pilot and CR-V pushed Honda light trucks to a total increase of 12.6 percent for the month. 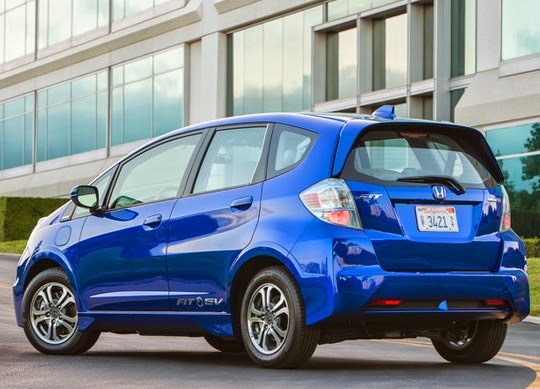 Honda Fit easily smashed its previous February record, rising 81 percent on sales of 5,652. 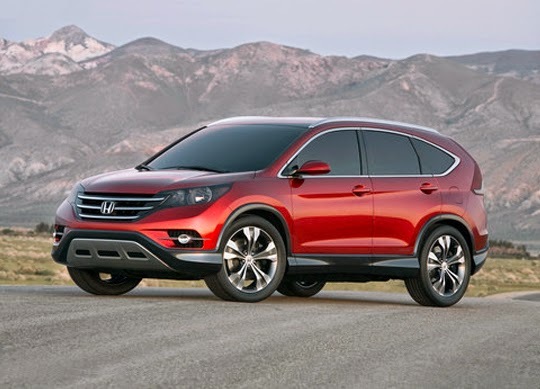 Sales of the best-selling Honda CR-V totaled 22,298 units, up 7.4 percent for the month. The Honda Pilot posted one of its best months in the last year with sales up 82.7 percent on sales of 12,629 vehicles. Overall Honda truck sales totaled 43,782 for a gain of 12.6 percent in February. "Strong February sales of both the sub-compact Fit and our 8-passenger Pilot SUV demonstrate the power of the Honda brand with individual buyers," said Jeff Conrad, Honda division senior vice president and general manager. "Honda is delivering incredible value throughout our product lineup that is resonating with our customers." Acura trucks continue to light up the sales charts with RDX setting a new February best just ahead of the launch of the refreshed 2016 model. MDX also sold at near record levels during a transition month as the 2016 model became available at Acura dealers in early February. Combined, the RDX and MDX gave Acura trucks a new February sales record. 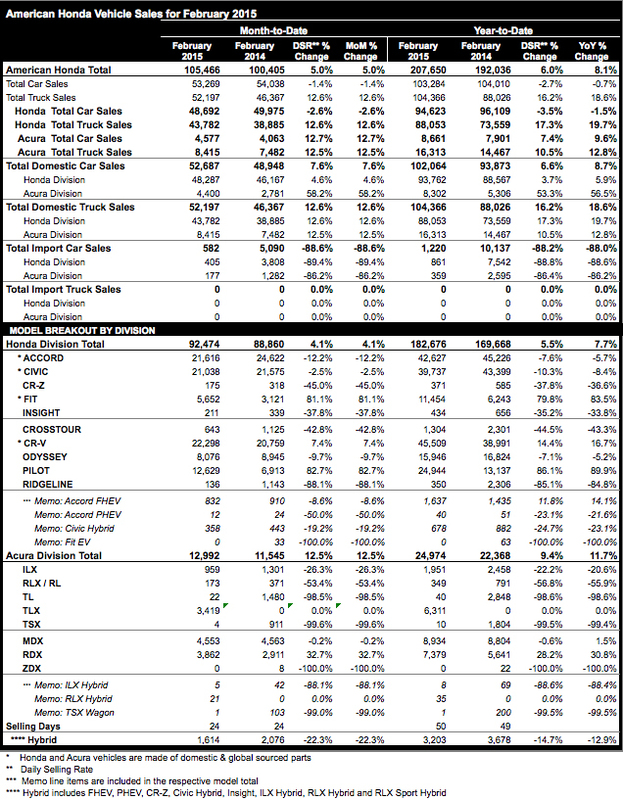 TLX sales remain strong, taking important share in the super-competitive mid-luxury sedan segment and spurring overall Acura car sales to 4,577 in February, an increase of 12.7 percent. And the significantly revised 2016 ILX went on sale mid-month, adding new power to a strengthening Acura sedan lineup. RDX captured yet another monthly sales record with 3,862 units sold in February, up 32.7 percent for the month. MDX maintained a strong pace as America's 3-row luxury SUV sales leader easily surpassed 4,500 units again. RDX and MDX combined for a February record of 8,415 Acura trucks sold in February, an increase of 12.5 percent for the month. 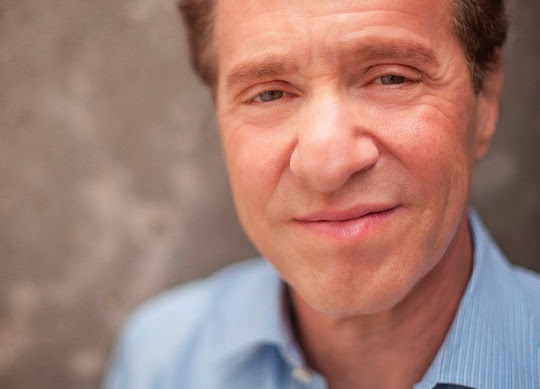 "While bone-chilling winter weather takes its toll on much of the country, Acura sales continue to reflect a strong warming trend," said Mike Accavitti, Acura division senior vice president and general manager. "Our MDX and RDX luxury SUVs remain red hot—with refreshed 2016 models only adding fuel to the fire. And the substantially upgraded 2016 ILX sport sedan now in showrooms nationwide will burn brighter than ever."